Hard to be alliterative early on a Monday morning. I started with moist, but I am not crazy about that word for some reason. I am very happy with Mighty Muggy, because it certainly is. Took Davey’s diaper outside at about 7:30, and it’s already too warm and humid. Let’s not even mention how that makes his diaper trashcan smells. David and I have realized that we are way behind on movies. If it was made after November 3, 2007 (Davey’s birth day), it is likely that we never heard of it. So we learned about and watched State of Play last night with Russell Crowe and Ben Affleck. Good show! Thank goodness for Netflix. Roll in the Hay Sock update: Cuff of second sock is over halfway done. It’s going much more quickly this time as I kinda sorta know what I am doing. Ok, it’s time to get the day rolling! Davey has been kind of anti-breakfast lately, so it is a challenge to find something to eat. I think so far he has had part of a hot dog bun. Going to go see if we can do a little better than that for him! I need to take some new pictures too. 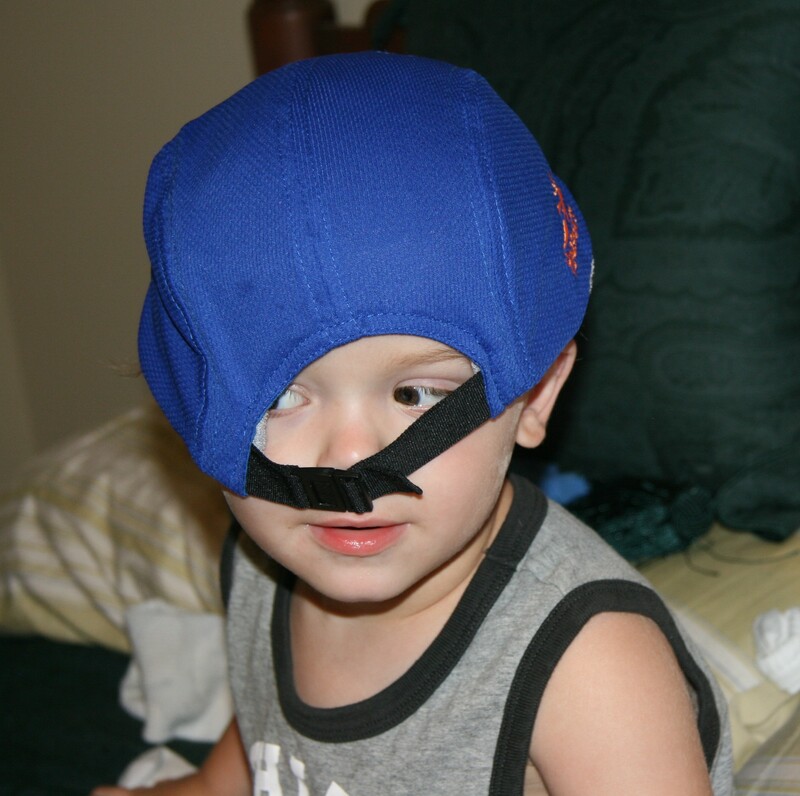 But gotta have at least one photo, so here’s one I took last week of Davey playing “silly hat”. If there is any comfort in knowing that – even though we are in S. Indiana – it’s still muggy and in the 90’s here!! Matthew is still not into b’fast either. You’ll also be encouraged to know that Davey is not the only one who melts down in restaurants – Matthew had a major meltdown in McD’s ;o) this morning. Tired and hot don’t help! Hey good to hear from you! I hope that by the time you make it to your final destination that it is cooler for you! Poor Matthew. Those restaurant meltdowns are no fun! I keep laughing thinking about eating with you guys last week. Matthew was making such funny faces and Davey was just laughing at him. They were having such a fun time. Talk to you soon!